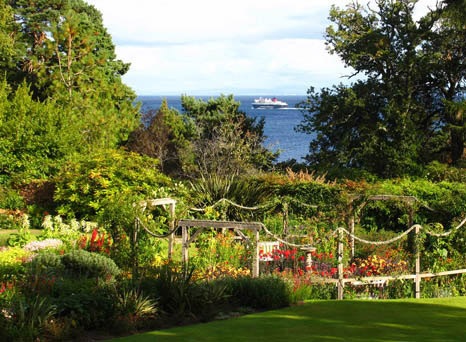 Arran does not have an airport so visitors must arrive by ferry, a relaxing way to begin your holiday. The ferry leaves from Ardrossan on the mainland to Brodick on Arran and takes about 55 minutes including disembarkation. It is important to book ahead if you intend bringing a car to the island. Foot passengers can buy tickets on the day. Timetables, prices and tickets are available from www.calmac.co.uk . A smaller seasonal ferry operates from Claonaig in Kintyre to Lochranza in the north of Arran. Please see www.calmac.co.uk for details. Cars can be hired at the pier in Brodick from Arran Transport (tel. 01770 302121). Travelling around the island without a car is quite possible using the excellent bus and postbus services. Service buses connect with all the ferries and will drop you off in Sliddery. For further information see www.spt.co.uk . Three alternative routes lead to Whin cottage, all scenic. The coastal route winds round the south east of the island, the "String Road" takes you over the centre of the island from east to west while the single-track road known as the “Ross” crosses the southern hills. Please see below for recommended driving instructions. Please feel free to download this pdf file if you have already booked your stay at Whin Cottage (you will have received a password for the file when you did so).